MILWAUKEE - On April 5th at a Republican Election Night party, Congressman Glenn Grothman was asked why he thought Republican’s will win in the upcoming presidential election. He said, “…And now we have photo ID, and I think photo ID is going to make a little bit of a difference as well." It didn’t surprise me that he thought voter ID would suppress enough Democratic votes to make the difference in a presidential election. But it did surprise me that he’d actually said it out loud… to a reporter… on camera. Yup, you read it right. Behind closed doors, Republican Senator’s discussed an elaborate plan to deny people their constitutional right to vote and they were giddy about it. On the floor of the State Senate, I fought for ensuring people’s right to vote. 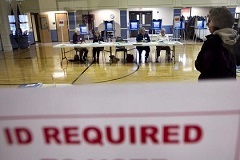 Since 2000, there are only 10 proven cases nationally of in-person voter fraud. More people are struck by lightning than commit in-person voter fraud. That’s why I believe voter ID laws will keep way more people from even going to the polls on Election Day than it ever catches. Several years ago Republicans figured out that people of color and college students were most likely to not have proper ID for voting. You know what else college students and people of color have in common? They are both groups that are more likely to vote for Democrats than Republicans. Republicans didn’t believe they could win fair and square, so they had to rig the rules. Only, this isn’t a game, this is people’s constitutional right to vote. The discriminatory voter ID law is ageist and racist, period. See more of Todd Allbaughs story on my Facebook page. 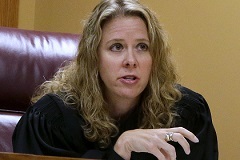 MADISON - For the past few months, we’ve been checking, almost every day, to see when Wisconsin Manufacturers and Commerce was going to start spending money on behalf of Judge Rebecca Bradley in her race against Judge JoAnne Kloppenburg for the Wisconsin Supreme Court. But we’ve found nothing, which is very puzzling. 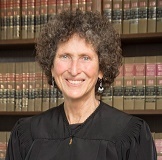 Is WMC hiding its $$ in the Wisconsin Supreme Court race? Vote to overturn Citizens United on April 5 in Wisconsin! 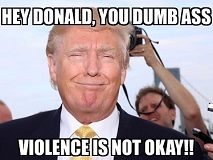 http://newiprogressive.com/images/stories/S5/donald-trump-dumbass-s5.jpg It’s been so dark, so ugly, so ridiculously comical at times, it must signal something. A nation at war with itself, or maybe not. Mike McCabe argues the nation is remaking itself, and doing it far ahead of the politicians. MADISON, WI - On Monday, Governor Scott Walker signed into law four higher education bills, Assembly Bills 740, 741, 742 and 744, calling the package 'college affordability bills' . These Republican bills do nothing to address the burden of student debt and the people of Wisconsin shouldn’t fall for the Republicans’ lack of action with these modest election-year smoke and mirrors. These anemic Republican bills do not provide a single ounce of relief for the roughly one million Wisconsinites burdened by the $19 billion student debt crisis. Republicans did not even pass the most significant of these weak bills which at least would have provided a tax break to a small percentage of those with significant debt. 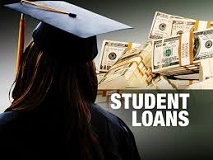 Democrats provided Republicans ample opportunity to support our ‘Higher Ed, Lower Debt’ bill which is a real solution to providing relief to Wisconsinites with student loan debt. The Democratic proposal allows borrowers to refinance their loans, just like a car loan or mortgage. It is a common sense, popular plan that would grow Wisconsin’s economy and unfortunately Republicans voted against this proposal several times this session. Gov. Walker and Republicans also cannot hide from their record of gutting higher education in Wisconsin. Since they came into power, the UW System has lost $795 million in state aid* and the technical college system has lost $203 million in state aid.